Published February 2, 2019 By Anna T. This post may contain affiliate links. Regardless, I only recommend sites I've researched and/or used and trust. Are you looking for a way to work from your home? Maybe you're a stay at home parent, college student needing some additional cash, or just in general fed up with your daily commute. If so, How to Find Real Work From Home Jobs can help get you on the path to work at home freedom. The eBook contains 73 pages full of everything you'd want to know about working from home, including a valuable list of more than 150 legitimate companies that regularly need at-home workers. In this section, I discuss things like your location and why it matters, necessary equipment, pros and cons of working at home, and more. I have spent many days per week since this website was started in 2010 digging through job boards on the web to find legitimate work at home job leads. There are new leads posted every day, so this is a crucial skill for you to have if you're serious about working from home. In this section of the book, I tell you exactly how to do what I do, which job boards to use for searching, and what search terms are going to give you the very best results. In this section, I share with you some of my “go-to” sites for finding valuable work at home information. This includes not only job boards, but also useful blogs similar to this one run by people I know and trust, as well as popular internet forums that are focused on remote jobs. I know that many of you are on social media much of the day. In case you weren't already aware, social media is an insanely useful tool in your work at home job search. And this goes for just about all the platforms you may be familiar with — Facebook, Twitter, and Pinterest specifically. In this section, I share with you some of the most trustworthy Facebook groups, Facebook pages, Twitter accounts, and Pinterest boards you should follow if you want to ensure work at home info stays in front of you all day long so you don't miss anything good. I wish it wasn't the case, but scams are still very rampant in the work at home world. However, this shouldn't be a concern for you if you know what to look for. In this section, we talk about the most common red flags that almost always indicate scams when you're researching work at home jobs. Not every work at home job is worth pursuing. Determining legitimacy is the first step. The second step is making sure the company you're considering is worth your while. In this section, I share with you the best methods for finding feedback from current and former workers of various work at home companies so you can decide for yourself if you should bother applying. 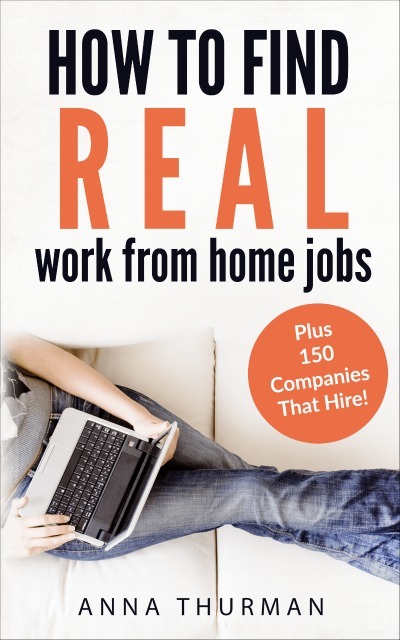 In this section, I've gone ahead and given you a head start on your job search by listing 158 legitimate work at home companies I'm familiar with that are frequently hiring workers. These are all divided up by category (phone jobs, chat jobs, search evaluation, transcription, etc.) to make it easier for you to browse. *Note to readers outside the US – Most of these companies hire US-based workers. This is not because I have tried to exclude anyone. It's because I simply do not come across as many work at home opportunities for people outside the US. That said, this book does contain a section with resources for finding work at home jobs outside the US. Over the years, I've gotten lots and lots of repeat questions from readers. Can I work from my smartphone? Which jobs are the most flexible? Which jobs offer night shift? In this section, I've listed some of these questions and provided answers that will hopefully help you. Visit Gumroad to purchase How To Find REAL Work From Home Jobs.